I made up this nice shirt dress in a nice Liberty silk crepe de chine print using Vogue 8847 pattern (now out print unfortunately). 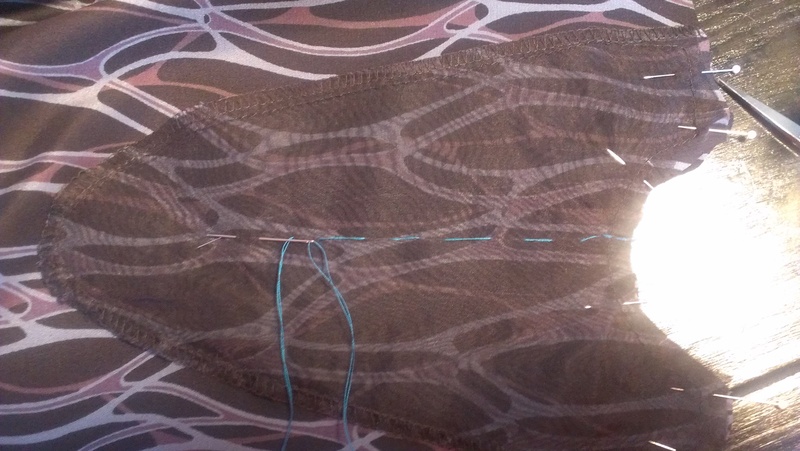 It was not too bad of a pattern to sew, it took me a couple of weeks over weekends and evenings after work. The pattern features a stand up collar, open placket, self-lined yoke, long sleeve gathered into a barrel cuff and self belt. I chose to not add the pockets because the fabric I used was pretty light and delicate, and I thought that the pockets would just weigh down the dress, especially if I had my hands in them. 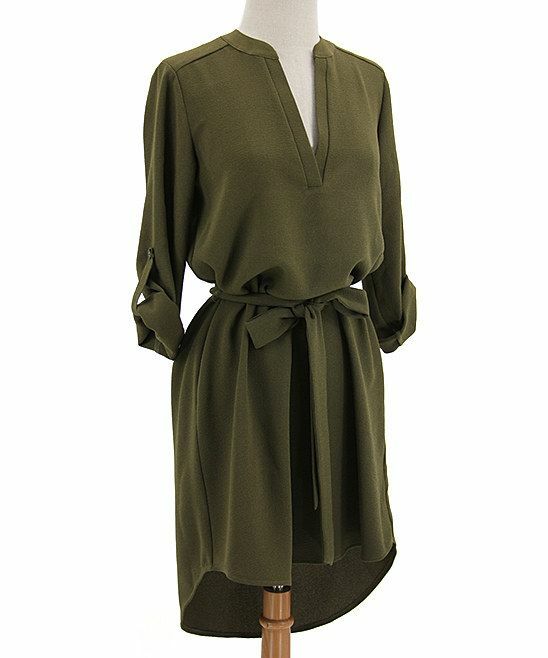 I made View A essentially for the collar style and the length of the dress, modifying the hem to be just straight across instead of curved at the front, split at the sides and straight at the back as the pattern features. 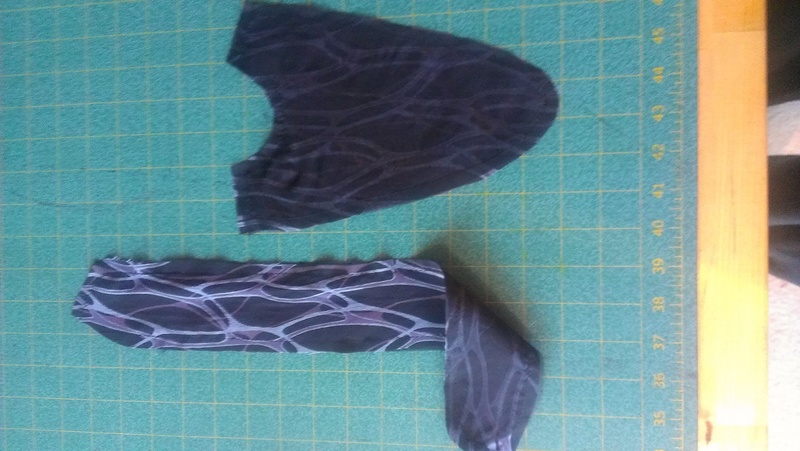 I cut out the pattern pieces of the dress as best I could, not really following the pattern cutting layout for view A, which calls for an insane amount of fabric, essentially 6-7 yards of fabric, if using a border print. I just went by view B to estimate the amount of fabric to purchase, more like 3 1/2 yards of 45″ wide material. 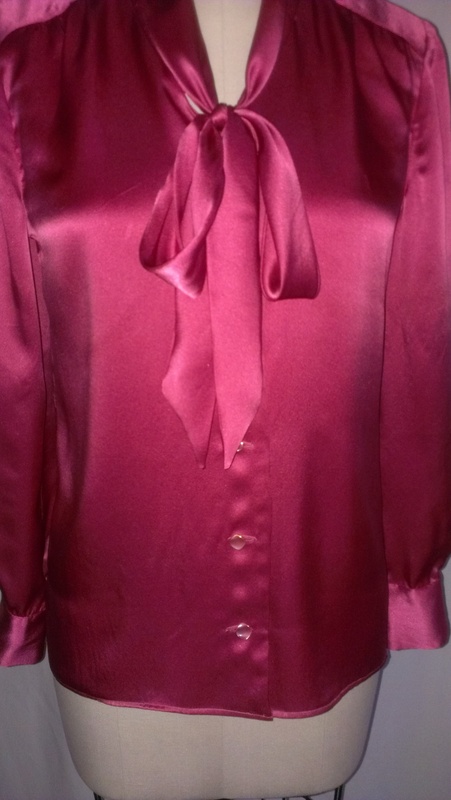 Instead of using sew-in or fusible interfacing, I used silk organza to interface the front facing and the collar. This was a great suggestion from the sales associate at Josephine’s Dry Goods, the wonderful fabric store where I purchased the material. 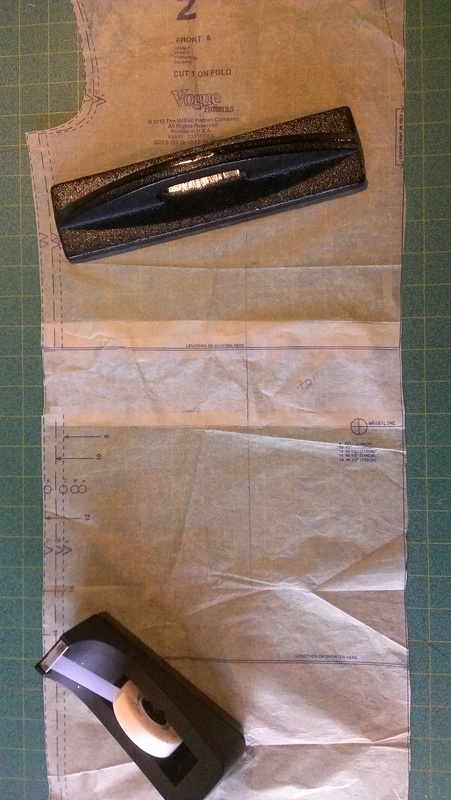 One part of the instructions were missing, the step between 11 and 12, where you are to sew the yoke back to the yoke front, attaching the front of the dress to the back of the dress, so that is something to take note of. I love how this dress turned out and am quite happy with the results! 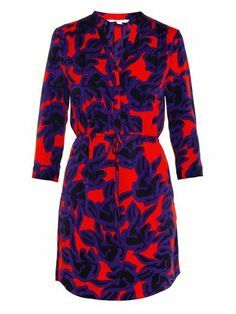 It is a lovely, casual yet elegant dress to wear and I just love this Liberty printed silk! This photo really makes the fabric look blue! Wearing my new silk dress! Me enjoying my new fabulous silk dress! This beauty I made for my stunning brunette friend (you know how you are 🙂 ) as a gift. 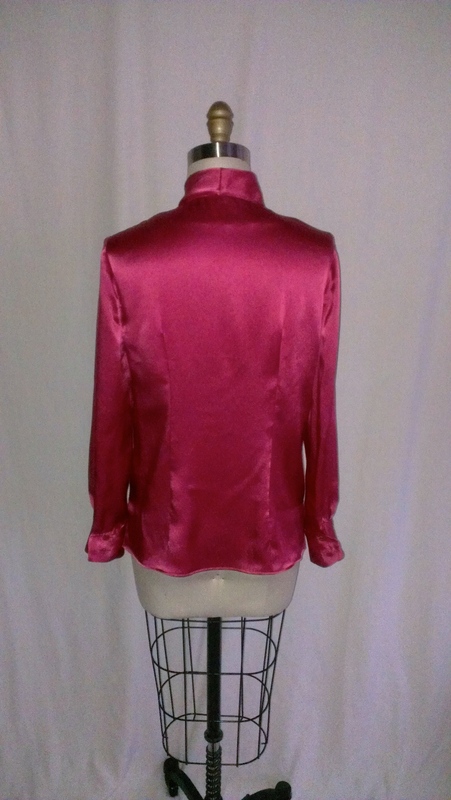 I have had this pinky/coral colored lustrous silk charmeuse for about two years now, keeping Her in mind to make a top for. 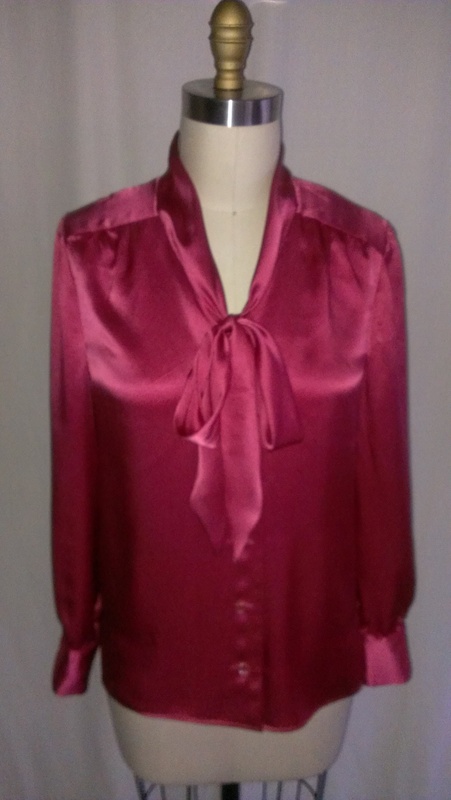 I finally had her body measurements (I measured them for her on Thanksgiving 2014 before dinner), and figured she would look really nice in a lower cut, tie neck blouse, in a favorite color that she loves, not to mention looks really pretty on her. 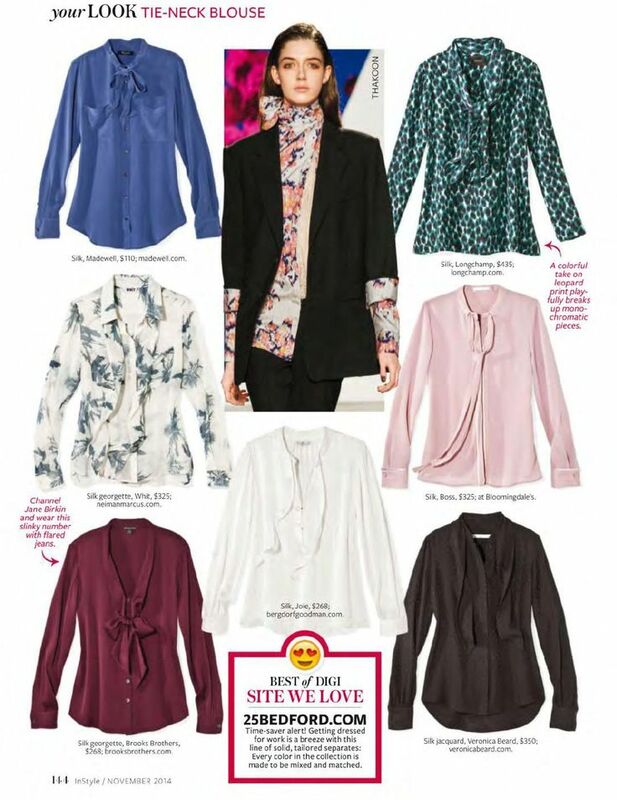 I used Simplicity 1784 pattern, view A, to make this blouse. I ran out to Button Emporium to find some pretty , unique, and special buttons to use for this top. I found some lovely German Word War II-era pink glass buttons and grabbed up enough, plus extra, to button up this beauty. I attempted to make this top as nicely as I could. 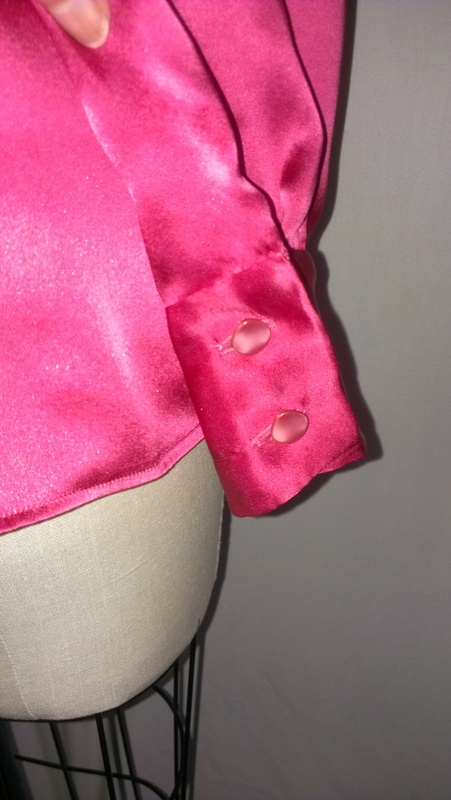 I used French seams for the side, sleeve and armhole sleeves, plus hand stitched the interior of the cuff and neckline seams. 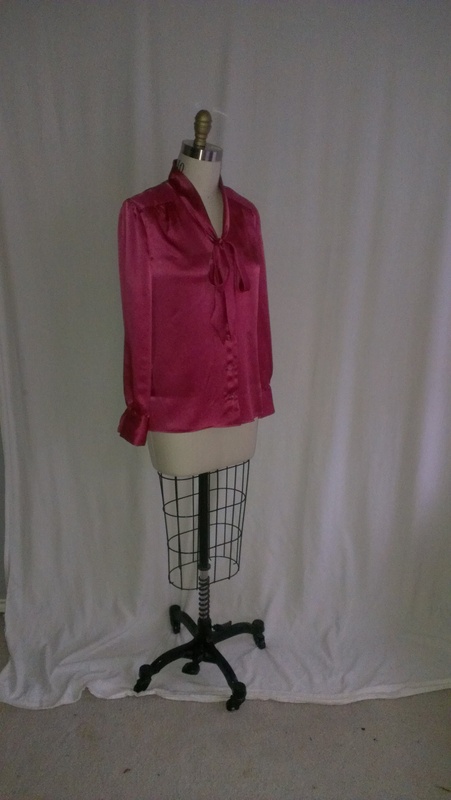 Next time I make this top, or any top like this, I will not use fusible interfacing, at least not in the neck facing, because it left the facing a little warpy and stiff, plus it shows a little. 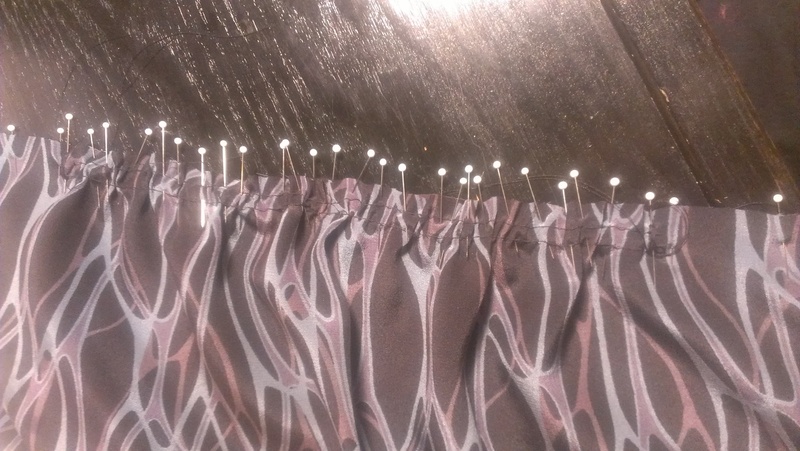 I will try a silk organza, or the self material, for any interfacing parts the next time.